Culpeper County was cut off from Orange by an Act of the Virginia House of Burgesses in 1748, effective May 17, 1749, when the first county court convened. The original territory included what is now Culpeper, Madison (cut off from Culpeper in 1792), and Rappahannock (cut off in 1831). Culpeper is a “granddaughter” of Spotsylvania County, from which Orange was formed in 1734, and “great-granddaughter” of Essex, from which Spotsylvania was taken in 1720. The county was named for Lord Thomas Culpeper, Colonial Governor of Virginia, 1680-83. He inherited his rights from his father, Lord John Culpeper, to whom King Charles II had given a large land grant. Lord Thomas Culpeper’s holdings, including all of the Northern Neck territory, were inherited by his daughter, Catherine, who married Lord Thomas Fairfax. Their son, the sixth Lord Fairfax, inherited the property and it was for him that the town of Culpeper, first called Fairfax, was named. Lord Fairfax’s Virginia estate, comprising 5,282,000 acres, was confiscated by the colonists when the Revolutionary War began. Lord Fairfax was the patron of young George Washington and engaged him at age 16 to survey his property in this area. In July, 1749, George Washington, then 17, was commissioned by the College of William and Mary as surveyor for the new county of Culpeper. Roger Dixon was the first clerk of the court and served 23 years. In 1860 the Culpeper Minute Men were re-organized under the rattlesnake flag. The company’s staff was organized under the same oak tree where the Minute Men of 1775 were formed. When the Civil War came the men were mustered in under Co. B, 13th Infantry. Other Culpeper companies organized for Confederate service were the Little Fork Rangers and the Brandy Rifles. A great deal of action took place in the county during the war, and several battles – notably Cedar Mountain and Brandy Station – and engagements were fought on Culpeper soil. Both armies marched through, fought, and camped in the county repeatedly during the four-year struggle. During the winter of 1863-64, Grant’s Army of 100,000 men camped within its borders. The Culpeper Minute Men were again mustered into service for the Spanish-American War but did not see active duty during their stay near Brownsville, TX. In World War I the Minute Men company lost its identity as it was absorbed in the 116th Infantry, 29th Division. The first telephone in 1894. In 1871, the first public school (one room) in the county was organized. 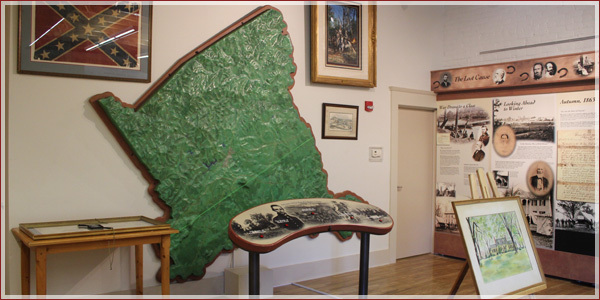 Situated in the rolling hills of Piedmont Virginia, Culpeper County rises from an elevation of 300 feet on the east and 600 feet on the west. It is bounded by the Rapidan River on the south and the Rappahannock on the north and is well watered by these and other rivers and streams. The temperature is moderate, with an average mean in January of 34.9 and in July of 75.9. Average annual precipitation is 40.98 inches. Culpeper has been ranked as the second healthiest place in the United States, second only to Asheville, N.C. In 1971, the U.S. Department of the Interior designated the Culpeper-Warrenton area as one of the seven most desirable places in the nation to live. Since then, the town and county have received countless accolades and awards – all evidence that this is a great place to live!